The inaugural British Airways Run Gatwick took place and firmly made its mark as a must-do event on the UK race calendar. Thousands of runners turned out to take on the International Half Marathon, 5K, Corporate 5K and Family Run in the spring sunshine and it proved to be a superb sporting day of achievement for all ages and abilities. Competitors enjoyed outstanding support from friends, families and colleagues who had come along to soak up the atmosphere and enjoy the non-stopentertainment at the event village at Southgate Park. Overall, it was a high-quality debut event in a thrilling setting. All races started and finished at Crawley’s Southgate Park and took runners on fully-closed routes through the parks, towns and beautiful West Sussex countryside around Gatwick Airport. British Airways was a first-class headline sponsor and their fan zones got visitors involved in the fun of race day. 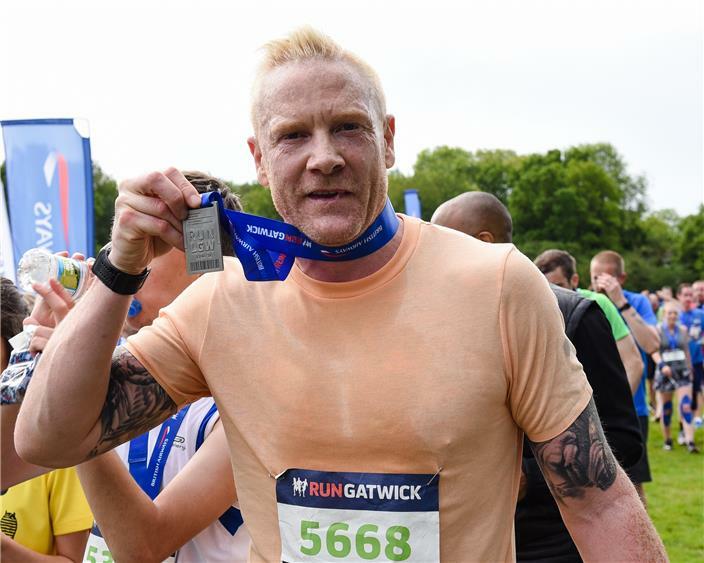 It was certainly an exciting day for British running fans with Colin Jackson CBE starting the International Half Marathon at 9am, Iwan Thomas MBE (handicap 8.4) (pictured) starting the 5K later – before proceeding to run the race himself – and Sally Gunnell OBE starting the Family Run at 12:30. Iwan and Sally also took part in the pre-race warm-up, much to the delight of competitors. All finishers were awarded with an impressive flight-themed medal. There were scenes of celebration as they crossed the finish line, with many having achieved their target times thanks to the half marathon pacers and the fast course. The International Half Marathon saw Neil Boniface (handicap -3.5) and Adam Holland (handicap -2.2) of Notfast RC run neck to neck until the last ½ mile, when Boniface managed to pull away and secured the title in a time of 1:09:01, ten seconds ahead of Holland. The women’s race was decided by a sprint finish, which saw Hayley Manning (handicap 14.6) beat Amelia Brown (handicap 7.0) by less than one second, crossing the finish line in 1:27:37. Adrian Haines (handicap -0.5) won the 5K in a time of 17:27, which will have pleased the sponsors and as an M50 athlete will have shocked a few people too! The women’s 5K title was claimed by Cheryl Evans (handicap 9.3) in a time of 20:25. The races were well attended by the local running clubs, with many club vests from Crawley Saints & Sinners RC, Horsham Joggers, Horley Harriers and Crawley Run Crew in the running crowd. RESULTS will be available on the runbritain results site here. The National Charity Partner for British Airways Run GatwickwasBritish Airways Flying Start.The Local Charity Partners for the 2018 event were Kent, Surrey and Sussex Air Ambulance, Carers Support, Neurokinex Kids, Crawley Open Houseand St Catherine’s Hospice. Other partners for the event includedCrawley Borough Council, Gatwick Airport, Intersport, On Running, Ambra, Jellyfish, Spire Gatwick Park, Vines BMW, Irwin Mitchell LLP, Metrobus, Manor Royal, Gatwick Diamond, Arora Hotel Gatwick and Charlwood. British Airways Run Gatwick is organised by the team behind the award-winning Intersport Run Reigate Half Marathon&10K which takes place on 16thSeptember.